I love the idea of collaborating with artists to create food. Everything about cooking is part of a creative process from choosing what to make to gathering the ingredients to the actual preparation and, of course, the presentation. Julia Sherman has been making salads with artists and chronicling the results on her blog Salad for President, and now she has a book of the same name. I received a review copy. In addition to cooking with creative professionals, she also planted the MoMA PS1 Salad Garden on the rooftop of the museum in Queens which became an ideal location for shared meals, performances, and talks. Sherman writes: “An artist reinvents the things you already know. They reframe the details of life and prod us to pay closer attention.” She suggests home cooks do the same by experimenting with ingredients and flavors and finding new ways to compose a meal. And, salads are perfect for experimentation and new composition. In some cases, the concept of a salad is extended to include brothier expressions like soup or cooked combinations like charoset. There’s even a chapter for “Other Abuses of the Format” including cocktails and desserts. But mostly, the book is full of interesting salads both simple and complex. There are also interviews with artists and other well-known personalities, and each one ends with a recipe from the interviewee. Alice Waters was interviewed, and she included her now classic recipe for Baked Goat Cheese with Garden Lettuces. Some other salads that caught my eye include the Tatsoi, Macadamia Nuts, and Shaved Coconut with Yuzu Kosho Dressing; Potato Salad with Sprouted Mung Beans, Yogurt, and Fried Black Mustard Seeds; and Pulled Chicken Salad with Napa Cabbage and Red Curry Puffed Rice. 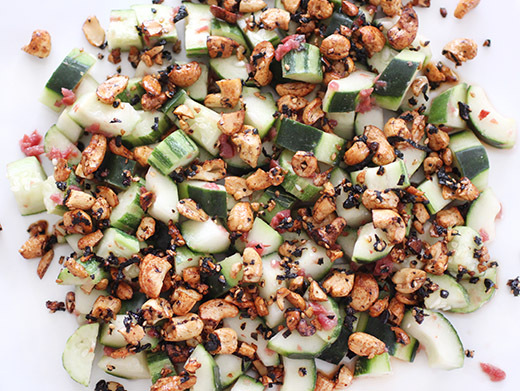 And, the Cucumber Umeboshi Salad with Cashew Crunch sent me off to find umeboshi right away. I found umeboshi, or salted plums, at a nearby Japanese market, and they’re often made with MSG. Luckily, I found a brand without it. You need to remove the pits, and then for this recipe, they were minced. I had two different types of locally-grown cucumbers, and they were partially peeled in stripes and chopped into chunks. 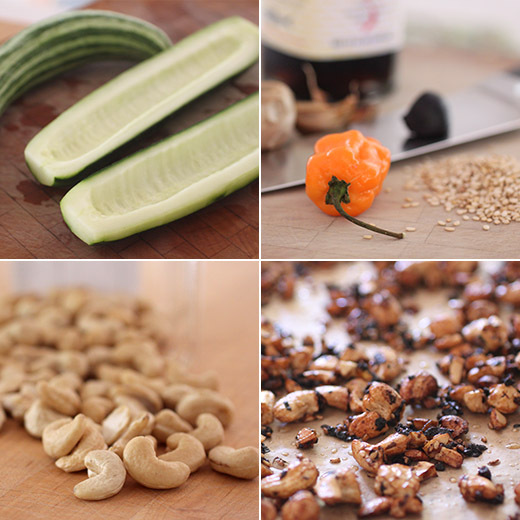 For the cashew crunch, cashews were chopped and combined with sesame seeds. Nori was cut into skinny shreds and added to the cashews with a paste made from black garlic, fish sauce, and a minced habanero. After stirring, the nut mixture was spread on a baking sheet and toasted in the oven until browned. Once cool, it became a crunchy crumble topping. The minced plums were added to the cucumber chunks and tossed with rice vinegar. 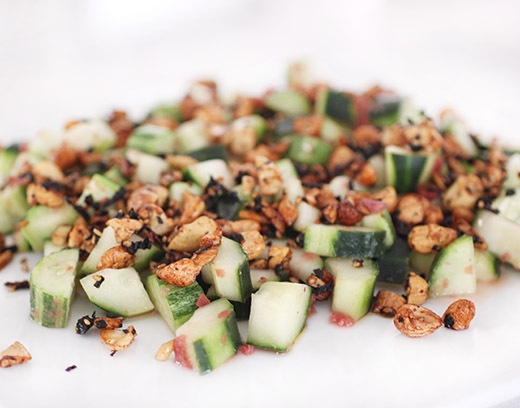 To serve, the cucumber mixture was topped with the cashew crunch. I loved the flavor of the salted plums with the cucumber. And, the cashew crunch could easily become a daily snack. The crunchy, umami-packed topping will be making frequent appearances in my kitchen. If you’re looking for salad inspiration or just ideas for using all sorts of vegetables, this book will serve you well. Recipe reprinted with publisher’s permission from Salad for President: A Cookbook Inspired by Artists. In Japan they say that umeboshi plums possess magical healing powers, the ability to cure everything from ancient Samurai battle fatigue to the modern-day hangover. Umeboshi are shockingly expensive, but a little of their concentrated, salty tartness goes a long way. When I buy cashews for cooking, I always opt for the broken cashew pieces as opposed to whole nuts; they are more affordable and taste just as good. Black garlic is fermented, and has twice as many antioxidants as raw garlic; its flavor is much sweeter and milder, like garlic candy, in a good way. You can find this at your Asian grocer, but it is widely available in mid- range supermarkets as well (they even sell it at Trader Joe’s). If you can’t find it, just substitute roasted garlic cloves with an added pinch of sugar. 2. Using a mortar and pestle, make a paste out of the black garlic, fish sauce, and habanero. 3. Roughly chop the cashews and toss them in a bowl with the sesame seeds. Cut the nori into thin shreds and add them to the cashew mixture. Add the black garlic paste and stir to combine it with the other ingredients as evenly as possible. Line a baking sheet with foil and coat it evenly with the sesame oil. Spread the nut mixture out on the foil and toast it on the middle rack of the oven for about 10 minutes, until the nuts start to brown lightly. Remove them from the oven and let them cool to room temperature. The nuts should go from sticky and soft to crunchy clusters as they cool. 4. Working with the cold cucumbers, remove every other strip of the skin with a vegetable peeler. Cut the cucumbers in half lengthwise. Scoop out the seeds with a teaspoon and discard (if using Persian cucumbers, you won’t need to do this). Cut the cucumbers into 1-inch (2.5- cm) chunks, as shown, or into ribbons and put them in a salad bowl. 5. Remove the pits from the plums and discard. Mince the plums into a chunky paste and toss them with the cucumbers. Add the vinegar and toss to coat evenly (you might want to use your hands to break up the plums here). Top with the crunchy cashew topping and gently toss to combine. What a lovely salad! Wonderful textures and flavours. Beautiful! Love the extra crunchiness from the cashews. what an awesome mixture of flavors and textures (and colors!)! i love the loose definition of salad. Lotta crunchy good flavor in this one! Really fun dish. And awfully tasty, I'll bet. Thanks! I love cucumber salads! And with those spicy cashews and salted plums make this one a standout!